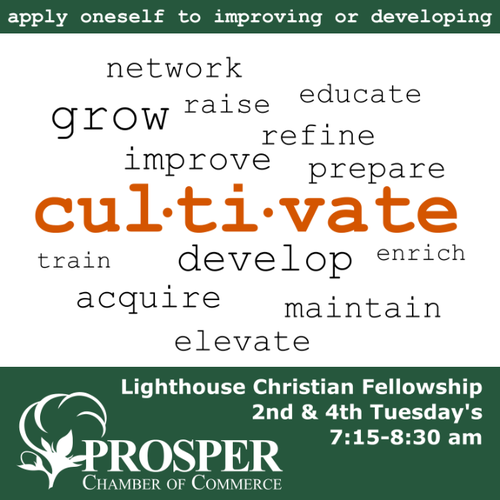 Our Networking Meetings take place on the second and fourth Tuesday of each month at Lighthouse Christian Fellowship Church, sign in and grab breakfast at 7:00 AM, the formal meeting starts at 7:30 AM. All attendees have 30 seconds to give their 'business commercial' and we also have a 10-minute presentation from our sponsor each week. It's an excellent way to network with members and breakfast will always be served. This is an energetic crowd, so be prepared to have a great time and to meet new people! Guests always welcome to any 3 chamber events before we request you become a member. Free Event, guests are welcome to any 3 chamber events before we request you become a member. © Copyright 2019 Prosper Chamber of Commerce. All Rights Reserved. Site provided by GrowthZone - powered by ChamberMaster software.